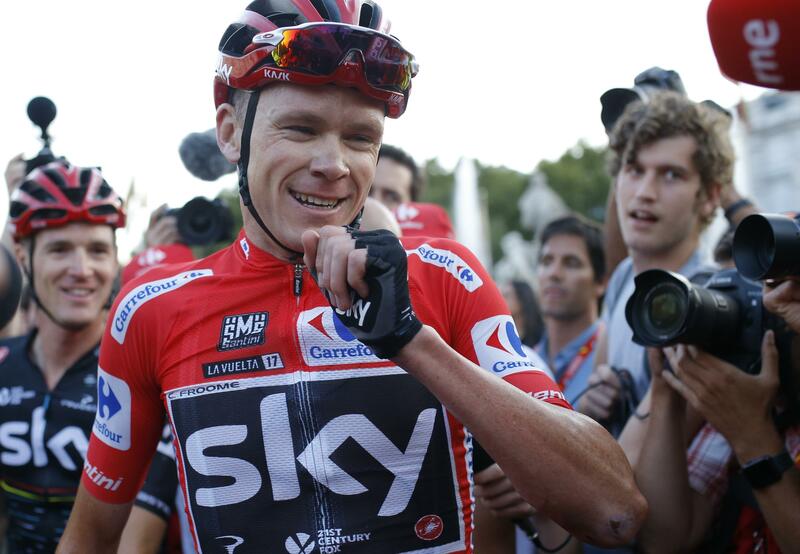 MADRID – Chris Froome paraded into Madrid to clinch his first Spanish Vuelta title and secure the elusive Tour de France-Vuelta double on Sunday, while Spanish great Alberto Contador celebrated the end of his remarkable career in front of his home crowd. Froome had virtually secured victory with a solid performance in the difficult climb up the Alto de l’Angliru on Saturday, which marked the last competitive stage of the three-week race. Riders cruised to the finish in Sunday’s 21st stage, with the leaders not challenging each other, as per cycling tradition. Italian Matteo Trentin won the final sprint to clinch his fourth stage victory in this year’s Vuelta. Contador, the three-time Vuelta winner, ended his career on a high note by winning Saturday’s difficult 20th stage. He was loudly cheered by Spanish fans as he arrived to cross the finish line one last time. Considered one of Spain’s greatest riders, Contador also won the Tour de France twice and the Giro d’Italia twice. He was stripped of a third Tour victory for doping. Published: Sept. 10, 2017, 6:11 p.m.